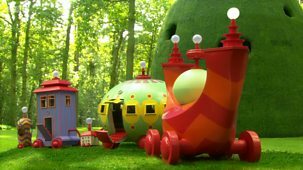 Series for young children about a magical place inhabited by toy characters. The Tombliboos have discovered a new game - hiding in the garden. Children's programme. Tombliboo Ooo is building a tower of bricks, but Tombliboo Eee knocks them over. Ooo is upset and starts to play sad music. In a magical forest, colourful characters have adventures. Igglepiggle and Upsy Daisy join the Tombliboos for a ride on the Pinky Ponk. 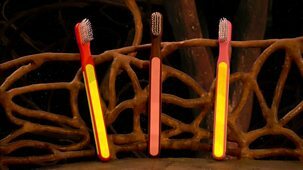 Series 1 - Where Are The Tombliboos' Toothbrushes? In a magical forest, characters have adventures. The Pontipine children cannot be found, and the Tombliboos' toothbrushes won't stay put. Show for young children. 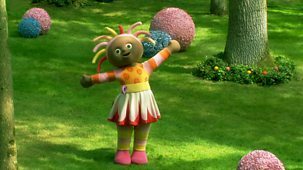 Makka Pakka is busy cleaning stones in the garden when his Og-pog runs away by itself. 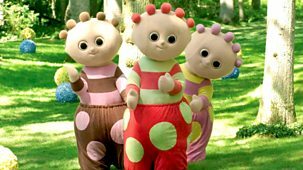 Makka Pakka and everyone in the garden give chase. Upsy Daisy wants to look at the pretty flowers in the garden, but Igglepiggle wants to ride in the Ninky Nonk. Then Igglepiggle finds the prettiest flower. 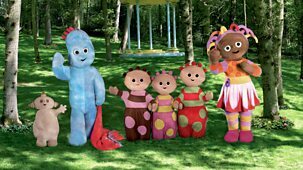 Series 1 - Where Can Igglepiggle Have A Rest? Children's programme. Igglepiggle tries to find somewhere to sleep and gets into Upsy Daisy's bed. But only Upsy Daisy is allowed to sleep there. Series 1 - Where's Upsy Daisy Gone? Series for young children. 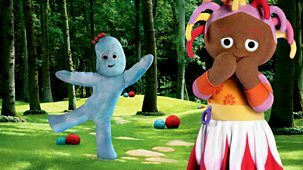 Upsy Daisy teaches Igglepiggle how to play hiding. Upsy Daisy is very good at hiding. Igglepiggle is impressed. Series for young children. Upsy Daisy kisses everything in the garden. She kisses a tree and a flower. Suddenly the Ninky Nonk stops and won't go.